This dairy free take on Mac & Cheese is just as satisfying a comfort food as the original cheese version, but healthier and lighter. I wish I could take credit for inventing this recipe, but that honor goes to Laura of the Petite Allergy Treats. My son was coming over and I wanted a side dish that would satisfy the vegan, gluten free and soy free crowd as well as the ‘can eat everything’ folks. Usually I would never have tried a veggie version of a melted cheese food, but I was intrigued (and motivated to make one dish instead of two for dinner). I love this dish. Delicious on its own merits it does have a flavor that is reminiscent of the cheese version. In some ways I like it even more than traditional mac and cheese. I’m just talking taste and texture here, not to ignore the easy way to sneak vegetables into a toddler. My two year old grandson fed himself a large helping with a fork and he is a finicky eater. It was a huge hit so I made it again for dinner with friends and they raved about it too. This recipe is definitely a keeper. 1) To prepare the pasta: Bring a large pot of hot water to a boil. Add a tsp of sea salt and a tablespoon of oil to the pasta pot. 2) When the water comes to a boil cook the pasta per package directions. I like the pasta a little al dente so I cook it 2 minutes less than the package states or until the pasta is soft but still a little firm. The paste will absorb some of the sauce and become softer so do not cook it too long or let it get too mushy. Drain the pasta when done cooking. 3) To prepare the sauce: Wash and peel the carrots. Cut them into chunks and place into a steamer basket over boiling water. Cover the pot tightly and steam until they are soft and easily pierced with a fork. Carrots in the steamer basket after cooking. 4) Purée the cooked carrots with an emersion blender or a food processor. Set aside. 5) In a saucepan, heat the 3 Tbs. of extra virgin olive oil. 6) Add the flour and whisk into the oil. 7) Stir constantly over medium heat until the four is cooked, about 2-3 minutes. When done it will emit a nutty aroma. 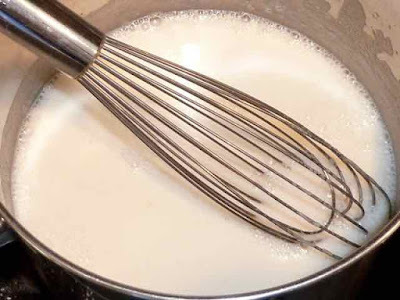 8) Add the 1 ½ cup of dairy free milk and whisk together well. Add the seasonings and mix well. Continue cooking, stirring frequently, until thickened. Milk added to flour mixture. 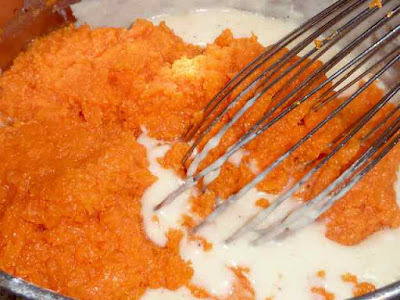 9) When thickened, add the carrots purée and mix well. Continue to heat over medium heat until the mixture is hot. The sauce has thickened after cooking. Adding the carrots to the sauce. The sauce after the carrots have been blended in well. 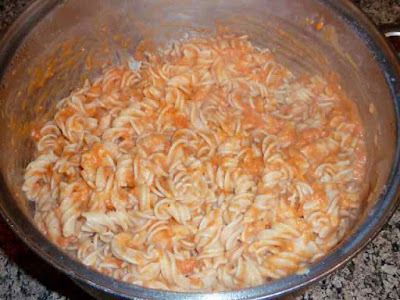 10) Add the carrot sauce to the cooked and drained pasta and stir until well mixed. 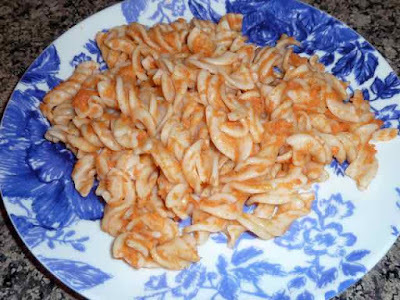 Pasta and carrot sauce mixed together. 11) Serve warm. Reheat leftovers. GLUTEN FREE VEGAN MAC & “CHEESE” AKA MAC & CARROT Ingredients 1 lb. Organic Carrots - washed and peeled 3 Tbs. White Rice Flour 3 Tbs. Extra Virgin Olive Oil 1 ½ cup Plain Unsweetened Non Dairy Milk of choice - I used Almond 1 tsp. Onion Powder 1/2 tsp. Dry Mustard ¼ tsp. Sweet Paprika 1/2 tsp. Himalayan Sea Salt ¼ tsp. Black Pepper 1 lb. Gluten Free Pasta - I used brown rice spirals, but elbows or small shells will also work as they hold the sauce well. (My favorite brand is Tinkayada Pasta Joy.) 1 tsp. Himalayan Sea Salt 1 Tbs. Oil Directions 1) To prepare the pasta: Bring a large pot of hot water to a boil. Add a tsp of sea salt and a tablespoon of oil to the pasta pot. 2) When the water comes to a boil cook the pasta per package directions. I like the pasta a little al dente so I cook it 2 minutes less than the package states or until the pasta is soft but still a little firm. The paste will absorb some of the sauce and become softer so do not cook it too long or let it get too mushy. Drain the pasta when done cooking. 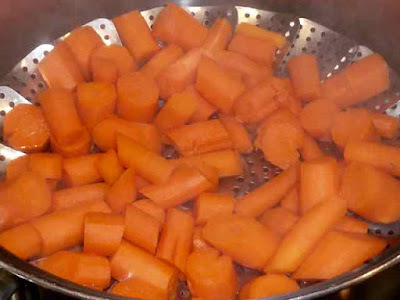 3) To prepare the sauce: Wash and peel the carrots. Cut them into chunks and place into a steamer basket over boiling water. Cover the pot tightly and steam until they are soft and easily pierced with a fork. 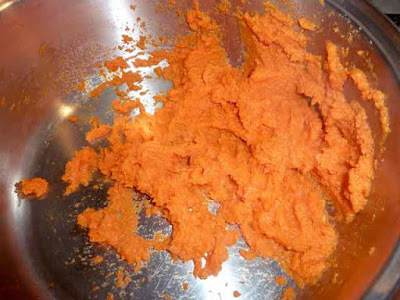 4) Purée the cooked carrots with an emersion blender or a food processor. Set aside. 5) In a saucepan, heat the 3 Tbs. of extra virgin olive oil. 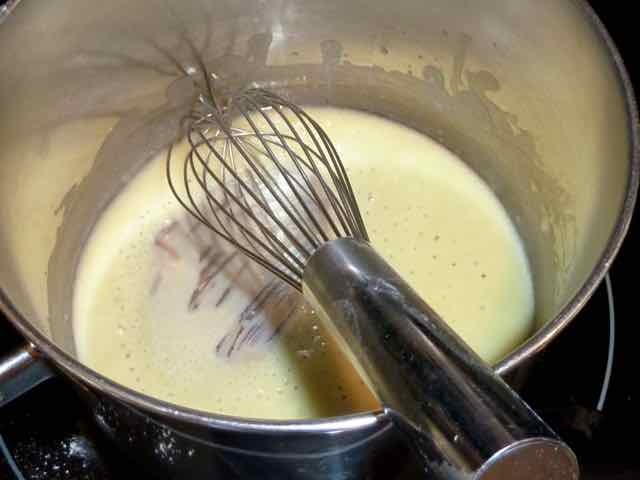 6) Add the flour and whisk into the oil. 7) Stir constantly over medium heat until the four is cooked, about 2-3 minutes. When done it will emit a nutty aroma. 8) Add the 1 ½ cup of dairy free milk and whisk together well. Add the seasonings and mix well. 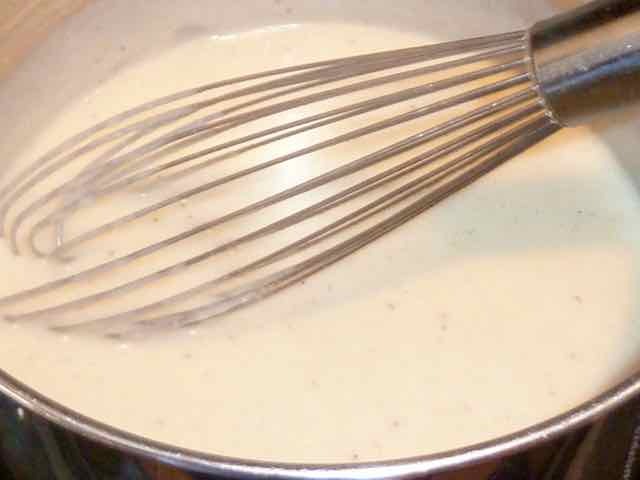 Continue cooking, stirring frequently, until thickened. 9) When thickened, add the carrots purée and mix well. Continue to heat over medium heat until the mixture is hot. 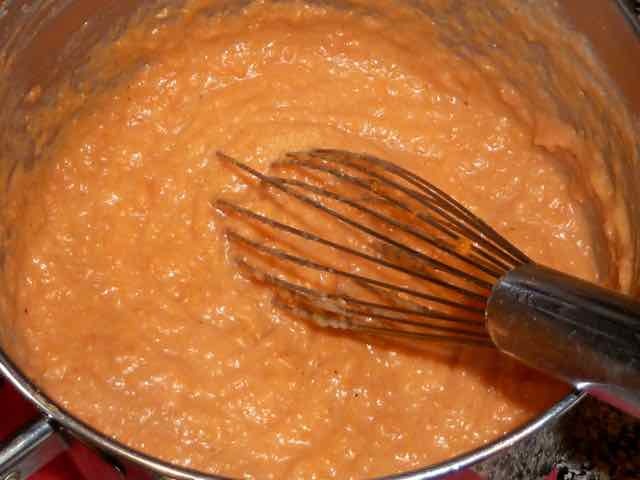 10) Add the carrot sauce to the cooked and drained pasta and stir until well mixed. 11) Serve warm. Reheat leftovers.